This paper reviews the arguments for and against the ‘vertical’ structural separation of Telstra, following the apparent failure of nominal ‘accounting separation’ as a regulatory means for ensuring fair and equitable provision of Telstra’s wholesale pricing to itself and to its competitors. The paper argues the several national benefits of a government buy-back of Telstra’s fixed wholesale network business, and suggests a new solution as to how this might be achieved at affordable cost and without excessive political risk. The paper also spells out the implications of the opposite eventuality, the complete privatisation of Telstra, and why this would not be in the national interest. It is timely to revisit the arguments for and against structural separation of Telstra, and in particular the buyback of the ‘natural monopoly’ of Telstra’s fixed network into public sector ownership. A rushed inquiry (the ‘Telstra Inquiry’) by the House of Representatives’ Standing Committee on Communications, IT and the Arts on this topic, starting in January 2003, was aborted by the then Minister, Senator Alston, despite – or because of – the receipt of 68 submissions, and before the Standing Committee had the opportunity to review them, once the ALP announced they would not push for structural separation because of the potential costs. Since then the Minister’s solution of ‘accounting separation’ to the problem of ensuring equitableness in Telstra’s wholesale pricing regime has apparently failed, as it has not enabled the regulator, the ACCC, to determine whether Telstra has abused its position of vertical integration of wholesale and retail functions. or force majeure legislation; and stressed the excessive costs and/or risks to government of these solutions. The major innovation of this paper is developing a fourth (hybrid) solution, a two-stage process, whereby both the costs and risks to the government can be significantly minimised. The paper also summarises the arguments for and against such a buy-back, and the negative consequences to the industry and the national economy if the opposite scenario is implemented (the total privatisation of the existing Telstra). It also warns against two possible flawed implementations of the recommended buy-back of Telstra’s wholesale fixed network business. Australia has a history of cycles in support of market versus publicly funded solutions to meet community needs for essential services, starting with the nationalisation of private telephone companies at Federation. Now, after twenty years of increasing privatisation, the pendulum is currently swinging back in favour of government intervention to meet certain community demands that the ‘free market’ or ‘competition model’ has proven incapable of delivering. in the telecommunications sector means a comprehensive assessment of structural reform is warranted. This discussion paper takes a second step and argues that a combination of a ‘vertical’ structural separation and the government buy-back of Telstra’s wholesale fixed network would also solve the problem of inadequate and inequitable national roll-out of advanced telecommunication services to meet community needs. It would also boost the economy by returning to levels of capital expenditure on advanced telecommunications infrastructure typical of the incumbent prior to privatisation, when its primary goal was the national provision of basic and advanced telecommunications services across Australia. a federal budget pushed into deficit. In the body of this paper, the author proposes how the buy-back could be implemented without either of those electoral liabilities. The buy-back can be achieved as a win-win for Telstra’s minority shareholders, Telstra’s competitors, the economy and the nation – and without driving a future federal government’s budget into deficit. But first this paper will review the arguments for and against such structural separation. ruthlessly dominated by a totally profit-driven Telstra, despite the best intent of government to tighten industry regulation at the time of the T3 sale. The 1981-2 Davidson Inquiry in Australia, reviewing options for delivering telecommunications during a period of intensive lobbying for increased competition, concluded that the fixed CAN (Customer Access Network) was a natural monopoly, and for that reason recommended partition of Telecom Australia into a government-owned national network owned and managed separately from the provision of customer equipment and retail services, which could be fully privatised and open to competition. This recommendation was immediately opposed by the ALP (influenced by Telecom’s unions) and by the then Country Party (influenced by Telecom’s management), and was finally disowned as a lost cause by the Liberal Party, the senior member of the then coalition Federal Government. Since then the prevailing belief by the national economic managers (the Departments of Treasury and Finance) has been that a level playing field for competition in telecommunications services can be achieved by either industry-specific regulation (as per the Telecommunications Acts of 1989 and 1991) or by general economic regulation coupled with telecommunications-specific access regulation (Telecommunications Act 1997 and the amended Trade Practices Act 1997). However many of Telstra’s competitors and business customers – and the Productivity Commission – have repeatedly disputed this, e.g. pointing out that by 2002 Telstra had managed to capture over 95% of the profits in the entire Australian telecommunications market. Industry lobbying in late 2002 led to Communications Minister Alston initiating (and then aborting) the already mentioned Telstra Inquiry in January 2003. Having avoided parliamentary analysis of the pros and cons of structural separation, Senator Alston in April 2003 announced a new requirement for Telstra (and the other major infrastructure carriers) to provide enhanced ‘accounting separation’ of its wholesale and retail services, for analysis by the ACCC through its record keeping rule (RKR) powers. However it would appear that under the new RKR regime Telstra has been able to limit the definition of its wholesale business to those areas where it has contractual wholesale relationships with other carriers – and need not include the supply of wholesale network capabilities to its own retail services. This asymmetry lies at the centre of concerns by both the industry and the regulator about lack of a level playing field., In addition the attribution of underlying costs to wholesale versus retail products, as required in the RKR, is notoriously arbitrary in telcos unless the businesses are physically separated. Since accounting separation appears to have proven unmanageable as a regulatory lever, there is good reason to conclude that only physical separation together with separate management and separate accounting of Telstra’s wholesale (network-based) and retail businesses will provide a truly level playing field for Telstra and its competitors. Twenty years after the Davidson Inquiry, a smart technology solution (‘spectrum sharing’, a.k.a. ‘line sharing’) emerged to break the natural monopoly of the copper CAN – at least in theory. Spectrum sharing allows two separate service providers to share a single copper access pair from the local exchange to a household or business premises, one using the lower spectrum for telephony and the other using the higher spectrum for high speed Internet access. In practice this smart technology (the ‘xDSL’ family, most commonly ADSL) has made only minor inroads into Telstra’s dominance in the copper CAN, due to two historical legacies: the limited opportunities for introduction of competitors’ equipment in exchange buildings; and the effect of RIM or pair-gain technologies in the copper CAN in blocking the use of xDSL -these latter technologies having been introduced in the 1980s for more cost-effective design of a telephony-only CAN. its shareholders) were to choose FTTP technology solutions that would make it excessively expensive for competitors to obtain direct access to its new CAN infrastructure. In summary, there is a real prospect of Telstra gaining an effective monopoly over the future optical CAN that would be just as unbreakable as its natural monopoly over the copper CAN seemed in 1981. Recommended basis for the wholesale-retail separation. Given that as early as 1994 the then regulator (AUSTEL) found that Telstra no longer dominated the mobile telecoms market, where it now has even more infrastructure competitors (Optus, Vodafone and – to some extent – Hutchison nationally, plus three small Wi-Fi and Wi-Max competitors regionally), there is no good reason to include Telstra’s MobileNet in the wholesale network business (NetCo). On the other hand, it will be important to include Telstra’s current inter-exchange network and associated systems in NetCo. NetCo will need sufficient wholesale transmission, signalling and switching capacity between NetCo’s fixed CANs to act as a minimum-cost wholesale network provider to all retail service providers (if they so choose), including ISPs and mobile service providers. The proposed first-order structural separation of Telstra’s current national network is shown in Figure 1. Fig 1 – Proposed structural separation of the current Telstra national network into the ‘NetCo’ fixed network infrastructure and the other Telstra networks – as a ‘first order’ simplification. The new retail Telstra would not be disadvantaged: it would be able to lease long-distance capacity from NetCo or from any of its infrastructure competitors (SingTel Optus, Nextgen Networks, UeComm, etc) on the same level playing field as its retail competitors. The new Telstra should not be restrained from investing in new infrastructure, any more than any other carrier; its freedom to invest in new network infrastructure will act as one of several brakes on NetCo’s wholesale pricing. Similarly NetCo, while beginning as a ‘fixed network’ business, should not be constrained from investing in advanced radio (terrestrial or satellite) infrastructure where it can identify a good wholesale business opportunity compatible with its objectives. NetCo’s competitive advantage in providing new infrastructure will consist fundamentally of its charter for long-term investment. NetCo’s prime goal must be to roll out advanced infrastructure nationally at globally competitive and regionally equitable wholesale prices, and if it can achieve part of this goal by investing in radio infrastructure, then that should be allowed under its charter. It will need to be subject to price control so that it does not abuse its monopoly position. And it will remain subject to the same access pricing regime, and general competition regime, as applies to Telstra’s current wholesale activities. NetCo’s relationship to other carriers, including the new Telstra, is shown in Figure 2. Fig 2 – Interconnection of NetCo network with other carriers, including the new Telstra. 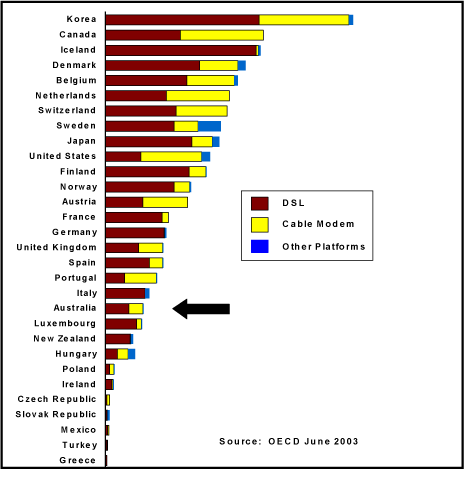 Industry observers estimate that Australia’s penetration of broadband access (less than 10% of households in June 2004, compared to 45% in the USA) has slipped to worse than 30th in the world; down from 20th amongst OECD members in June 2002 – which do include the highly broadband-endowed Singapore, Taiwan or Hong Kong economies. The most recent OECD figures are shown in Figure 3. Fig 3 – International Competitiveness – comparative rollout of broadband access. Whereas in the 1980s Telecom Australia was a world leader in its use of advanced telecommunications technologies – whether optical fibre cables, microwave links, solar-cell powered digital rural radio telephony, ISDN, No. 7 signalling, mobile telephony, digital data networks, high speed LAN interconnection etc – Telstra post-privatisation has become risk-averse to new technologies in advance of proven pay-back experience overseas. For example, after two years of publicly talking down the need to invest in broadband cellular mobile (3G) technology, Telstra has recently chosen to co-invest in Hutchison’s existing 3rd generation network, preferring retail competition to infrastructure competition. From a purely commercial point of view, this was smart tactics – but it is indicative of Telstra’s reluctance to incur any risk in investing in advanced broadband technologies. Australia’s lag in broadband take-up is serious, since it holds back national productivity, especially for the knowledge economy – see box – and it disadvantages the micro-economies and educational infrastructure of rural and remote Australia (RURA). In addition, since broadband access is critical in supporting cheap Voice over IP (VoIP) solutions, the limited availability of broadband access will keep a high ‘floor’ under the cost of voice services, to our national disadvantage. In the early 1990s the concept of The Clever Country arose as a vision for the 21st Century. This would enable a developed country like Australia to build on the strength of its excellent educational system to grow new export industries through ‘knowledge workers’. The concept depends on rapid rollout of broadband telecommunications so that knowledge workers can export their advanced products and services, Negroponte’s ‘bits not atoms’, to the world. The Clever Country concept was embraced by the Hawke-Keating government in Canberra and by the Kennett-Stockdale government in Melbourne – as well as by their counterparts in Ireland, Canada, Singapore and several other forward-looking economies. But in Australia it has been undermined since 1996 through cutting funding to tertiary education and research, and since 2001 through systematically reducing community expectations for the rollout of broadband access. The widespread availability of affordable broadband access remains important to Australia to support its knowledge economy. It is also vital to meet parents’ expectations for world-class education for their children. In a modern society, all secondary school children (and increasingly, later-year primary school children) need high-speed Internet access to carry out research for their school projects, since the rate of growth of knowledge far exceeds the ability of any school library to meet their needs through books and videos. And school children, like adults, need high-speed Internet access at home as well as school or work in order to complete their assignments. The public submissions to several national inquiries, most recently the Estens Regional Telecommunications Inquiry (2002) and that of the Broadband Advisory Group (2002/3), have emphasized the social and economic disadvantages suffered in RURA through lack of access to advanced telecommunications services at reasonable cost. Submissions to the Estens and BAG inquiries emphasized the inequities of both the availability and pricing of broadband services outside the capital cities. The Federal Government’s response, as so often in the past, was essentially a short-term fix: to throw some money at the problem, e.g. short-term subsidies to new regional carriers (whose longevity is problematical) and extension of the publicly funded AARNet’s capacity into regional university campuses. This piece-meal approach contrasts with the internally cross-subsidising financial capability of a government-owned carrier to roll out new services into RURA. At its birth as a GBE in 1975 Telecom Australia set itself the goal of providing a telephone in every home by 2000 – and achieved this goal by 1990. A new NetCo could similarly provide affordable broadband access in every home by year 2015 – through a combination of satellite, terrestrial radio, xDSL and FTTP solutions. The high wholesale margins obtained in the densely populated parts of Australian cities could subsidise the rollout of broadband access elsewhere – while still providing satisfactory dividends to the federal government. From 1997 (the year of the T1 float) to 2003, Telstra’s capital expenditure within Australia – largely devoted to rollout and renovation of its national network – has been reduced from 28.2% to 15.8% of its total revenues. Ever since the listing of Telstra shares in 1997, the Telstra Board and management have been under fierce pressure from institutional investors to maximise Telstra’s short-term cash-flow profits, to the detriment of faster rollout of advanced national infrastructure. A pro-rata return to the network capital expenditure rates of the late 1980s (typically 25%) would inject an estimated additional $2B per year into the national economy from procurement alone. Assuming conservatively that the economic multiplier effect is 3-fold, the national economy would benefit from an additional $6B per year. Australia has learned the hard way that competition policy alone cannot provide parity in availability or pricing of telecommunications services to those living in low-density populations such as rural and remote Australia (RURA). Compensatory mechanisms such as the Universal Service Obligation (for the basic telephone service) and the government funding of infrastructure or service subsidies in RURA (e.g. HiBIS subsidies for broadband) have been a feature of the Australian telecommunications market since the introduction of competition in 1991.
in order to maintain the status quo in local call benefits prior to the introduction of competition to the incumbent Telecom Australia in 1991, these Acts preserved the local call charging zones prior to 1991 – which were largely defined in 1960 with the introduction of the PMG Department’s Community Telephone Plan, based on the then radically new Subscriber Trunk Dialling technology. Needless to say the major capital cities have doubled in population and greatly increased in girth since 1960, leading to inequities in both local call reach and White Pages visibility for those living beyond 50 km from their city’s GPO. Considerable lobbying is currently taking place by some of the fringe councils (e.g. the City of Casey in Melbourne’s south east, and the City of Penrith in Sydney’s west) to rectify this historical anomaly. 80 km) – and thereby forgoing appreciable revenue and profits – it would still have to secure ACCC approval. Telstra’s carrier competitors would hardly be expected to support a change that deprived them of timed-call long distance call tariffs as alternative suppliers of telephone services to those outer city councils beyond 50 km – as they cannot at present economically compete with Telstra on local call rates. In fact Telstra, following many months of negotiation with the cities of Casey and Penrith, has shown no sign yet of being willing to forgo that extra 3c per call for telephone calls sent over the 50 km Wide Area Call limit. Casey and Penrith councils have reached an impasse. One of the many advantages of the structural separation proposed in this paper for Telstra is that NetCo can be given the power – under suitable regulatory supervision – to adjust its call charge zones to align them with current demographics, without disadvantaging any of Telstra’s competitors relative to the retail Telstra. They would all be equally affected by such underlying wholesale changes in the underlying network technology. Given pressures on Australian governments to avoid deficits, it is understandable that many are reluctant to fund major infrastructure developments – such as new freeways or railway lines – that require billions of dollars to be spent on construction for several years before any revenues are obtained. However the national wholesale telecommunications network is already a highly profitable business, whose extensions and renovations can be achieved without significant curtailment of services or loss of cash flow. Furthermore this network business, in its historical manifestations from PMG’s Department to Telecom Australia to AOTC to Telstra Corporation, has a century of track record in demonstrating its ability to fund new network rollouts largely through cross-subsidisation – and through the issuing of government bonds when needed. The NetCo business, as a government owned business enterprise, would have little difficulty in raising the loans it would periodically need to finance peaks of capital investment that exceeded its ability to pay out of annual cash flow. In one of the most cogent of the submissions to the Telstra Inquiry that opposed structural separation, the economist Ian Martin from Macquarie Research Equities argued that continuation (and improvement) of the current access pricing regime is vastly preferable to structural separation. To support this proposition, he argued that telecommunications services are so integrated into networks that ‘there is a practical constraint in drawing a line between network and services’ . This argument is unlikely to impress an experienced telecommunications engineer. In fact the AUSTEL Interconnection Model (1995) and its ACIF-funded successor demonstrate how telecommunications wholesale services can be conceptually and physically separated from retail services. The real issue here is the cost, not the feasibility, of separation. The flexibility of modern software-controlled network technology makes such separation feasible at relatively low cost. The fact that Telstra has chosen to use a high level of integration between its support systems for both wholesale and retail services does not prevent it from functionally separating out the information systems and equipment needed to manage its numerically much smaller range and quantity of wholesale services from those supporting its large array and vast number of retail services. In its submission Telstra claimed that the cost of separation would include the cost of development of duplicate back-end systems (costing ‘in the order of $400 to 500 million’) and approximately $80M pa in additional running costs. The running cost figure is plausible (and not large enough to be significant), but the development cost estimate is only credible if the new systems were to be developed from scratch – which is unnecessary. In practice the existing systems – those that actually overlap the NetCo and ServeCo business functions – can be duplicated, and then from each ‘clone’ the non-relevant data can be expunged: e.g. NetCo can delete retail customers from its CRM databases, and ServeCo can delete wholesale customers from its. There will then be significant new system integration work required, but arguably for less than $50M for each business. Telstra claimed that its separation costs would amount to a once off cost of ‘the order of $2 billion, and the ongoing administrative costs could amount to some $800 million per year’. It calculates the first whopping figure by using as a benchmark the US telecoms company Verizon’s estimate that the structural separation of its network and retail business would cost US$800M – but one must be very sceptical of the defensive estimates produced by incumbent carriers, here and abroad. It would seem that both Telstra and Verizon have assumed worst-case network boundary separations, such as the need to create new interfaces between Telstra’s thousands of CAN ‘islands’ and its inter-exchange networks, rather than the far fewer (less than 70) and much more traditional ‘Points of Interconnect’ needed to separate Telstra’s total fixed and mobile networks as proposed in this paper. Most of these Points of Interconnect are already established, connecting Telstra’s fixed network with its competitors; it will become a matter of reconnecting Telstra’s mobile networks external to rather than internal to these gateways. Telstra has continually used LRIC arguments to justify large access prices, most of which have subsequently been reduced through arbitration by the ACCC using more pragmatic decision-making. The avoidance of excessive rises in wholesale prices can be achieved by a combination of the current ACCC regulatory powers (over a separated NetCo) with an explicit price control regime on wholesale pricing of essential services – together with the ability of the newly privatised Telstra to invest in new infrastructure wherever it calculates that NetCo’s wholesale pricing is excessive. Telstra argued that the ‘economies of scale and scope Telstra secures through integrated operation substantially lower the costs of Universal Service Obligations, substantially increasing their sustainability'. Logically the USO obligations (and subsidies) would need to be reviewed under a new regime where NetCo would have the prime responsibility for rollout of national telecommunications infrastructure under the new arrangements. But a review of USO arrangements would be timely in 2005 in any case, to reassess the community’s expectations of a basic telecommunications service. It seems quite plausible, as argued not only by Telstra but also by the Federal Government and the merchant banks USB Warburg and Macquarie, that the integrated Telstra must have better potential for achieving ‘economies of scope and scale’ than either NetCo or the new Telstra. But perhaps not all that much better. In terms of scale of purchasing, NetCo will have the lion’s share (and hence most of the scale) of current capital expenditure; and the scope and scale of Telstra’s retail products, retail customers and retail income will not be reduced one iota! In terms of the efficiencies of scale of operational expenses, largely staff-related, there does not seem a significant difference between the per capita savings each business can make with a likely staff of between 10,000 and 30,000 compared with the peer capita savings possible with the 43,000 in the current Telstra, in accommodating, equipping and managing them – other than the undeniable need for each company to fund its own Board and corporate centre. The putative superior efficiency benefits of the current integrated organization have to be weighed against the perception that 80% of these efficiency benefits are currently transmitted to Telstra’s owners, not to the greater benefit of its customers or the national economy. A corollary of the belief in the power of ‘the market’ to solve all of Australia’s telecommunications needs is that structural separation is far inferior to the solution of a totally privatised Telstra. It is worth devoting some space to delineating why the full privatisation of Telstra would be the worst possible outcome for fair competition, for regional equity, for the national economy – and for democratic processes in Australia. The most predictable result of fully privatising Telstra in its present structure will be an accentuation of its recent pattern of border-line anti-competitive business practices (incurring competition notices from the ACCC), backed up by a budget for litigation that greatly exceeds that of the regulator, let alone Telstra’s competitors. These tactics, when challenged, can be fully justified by the Telstra Board as consistent with its obligation to keep increasing shareholder value. More dangerously, a fully privatised Telstra would be free to lobby politically, without any restraint from its government shareholder, to resist any further regulatory or legislative constraints. Its purchase of mass media outlets, such as a major newspaper chain or a national TV network, would be well justified to its shareholders as necessary to protect and expand its Sensis directory revenues through new cross-media dominance; but this would also give it more political power than Kerry Packer or Rupert Murdoch to affect both electoral and legislative outcomes. Telstra’s market dominance has already deterred most financial institutions from major investment in new infrastructure competition to Telstra since 2000, particularly following the commercial failures of both IP1 and Nextgen Networks during 2003. Even the parent companies of AAPT and Singtel Optus, both with deep pockets (through owning large incumbent telcos), have halted any further significant infrastructure expansion by their Australian subsidiaries. The degree of under-investment in the Australian economy due to the deterrence effect of Telstra’s dominant position can be conservatively estimated as well over $1B pa – apart from Telstra’s own pattern of capital under-investment since 1996/97. If Telstra were to be fully privatised, it would be expected to use its scale and scope to demolish any serious competitive threats to its margins, and to invest shrewdly in establishing an unassailable new area of market dominance – the all-fibre CAN, complemented by a defensive introduction of OF together with VDSL in the old copper CAN – without fear of competitive investment. Prices for some key residential and business telecommunications services would then be expected to significantly increase. A fully privatised Telstra, unprotected by Government majority ownership from the most exigent demands by investor institutions for short-term increases in its profitability, will have even less motivation than now to roll out advanced infrastructure – well beyond basic telephony – into short-term unprofitable markets such as RURA. The de-merger route was ruled out because of its excessive costs and uncertainty: specifically the perceived requirement to achieve full support from the Telstra Board and management. (Of course a single-minded Government, like a private sector controlling entity, would simply change the directors and if necessary the senior management, to achieve the majority shareholder’s goals). The costs of the de-merger process were estimated to be an ‘order of magnitude’ greater than that of WMC’s 2002 de-merger ($125M). The take-over option was ruled out as being prohibitively costly, requiring an outlay of an estimated $39B (including a $9B premium on the then market value of the aggregate minority shareholding – i.e. a 30% premium) with advisory costs of $100M for the take-over and additional costs of c. $200M for the subsequent sale of one or both of the separated entities. a negative impact on the general capital market in Australia, as a likely consequence of government intervention. the risk to the Australian capital market could be closely circumscribed; indeed the change of structure from the current highly regulated Telstra (with abnormally restrictive ownership conditions) to an unleashed fully privatised new Telstra (with no such restrictions) could be managed in such a way as to satisfy the capital market’s concerns. Many investors could be persuaded to see such a Telstra transformation as a satisfactory finale to a hitherto highly flawed process. It is rather striking that the Finance/CITA submission sees the potential national benefits of structural separation only in terms of ‘the argument that it has the benefit to provide greater and fairer retail competition'. Economic rationalism remains pure in the policy engine rooms of the Federal Government. Following continued lobbying by the ACCC and Telstra’s carrier competitors, a federal government in 2005 uses its Ministerial powers under the Telecommunications Act 1997 and Trade Practices Act Section XIB powers (under section 151BUAA and related sections) to require Telstra to separately account for its national wholesale fixed network business (NetCo) and its retail (and other, including offshore) businesses, as a preliminary move towards functional separation of NetCo. (Telstra’s mobile network is not considered by the ACCC to be market dominant, and its role as a wholesaler to other carriers is assumed to be negligible. Telstra’s mobile network would therefore not be included in NetCo.) The accounting separation would need to be subject to due diligence by the government to ensure that NetCo is not disproportionately loaded up with Telstra’s corporate overheads, especially retail-oriented corporate marketing and sponsorship. While primarily motivated to immediately providing a more level playing field for Telstra’s competitors in achieving equitable access to wholesale pricing, Step 1 will enable the independent valuation of Telstra’s national wholesale fixed network business versus the rest of its domestic and offshore businesses. For the sake of argument, let us suppose conservatively that the NetCo is valued at $40B, and the rest of the current Telstra assets at $20B. (The wholesale business, being essentially a monopoly, is prima facie assumed to be the more valuable than the rest.) Let us call the NetCo valuation the Reference Valuation. Following continued lobbying by the ACCC and Telstra’s competitors that despite accounting separation Telstra is able to maintain too dominant a market position through the collaboration of its wholesale and retail divisions in bundling services, a Federal Government in 2006 passes legislation to enforce structural separation of Telstra’s national wholesale fixed network and related operating (including wholesale billing) systems from the rest of its network and business assets. This is required to be carried out at Telstra’s expense. The Federal Government would then offer to buy from Telstra its wholesale fixed network business at a premium, e.g. for $43B, as a combination of its 50.1% equity in Telstra (worth $30B) plus cash and government bonds ($13B). This would leave the minority shareholders, previously owning an asset worth $30B (49.9% of $60B), with an asset worth $33B (100% of an asset worth $20B for the new Telstra business plus $14B in cash and bonds, much of which could immediately be distributed to shareholders). The minority shareholder’s position would have immediately improved by 3/30 = 10%. The use of government bonds to provide attractive but deferred payments to the minority shareholders avoids the Federal Government having to take too great a hit on its budget in the year of the buy-back. The issuing of government bonds to fund say $10B of the expected $43B (rough estimate) purchase of the current Telstra national wholesale fixed network business will provide investors with an attractive fixed interest alternative to property and equities, and could be done in such a way as to avoid excessive cash demands on the Federal Budget in the year of the buy-back. (The rest of the purchase would be via $3B in cash and $30B in released equity.) The pricing of the wholesale network products, already set at high margins by Telstra, should provide a long-term revenue stream ample to provide the dividends on the government bonds as well as ongoing dividends to the Federal Government and repayment of the interest on any loans needed by the new ‘NetCo’ to finance its accelerated national roll out of advanced telecommunications infrastructure. But the immediate 10% return is only the direct and most certain component of the value that the Federal Government can provide to the consenting minority shareholders to ensure their agreement. The Federal Government can further motivate the minority shareholders to agree to this transaction by adding greater value to their shares. It can do this by including in the legislation clauses which, triggered by the agreement of a majority of the Telstra minority shareholding to the deal, would remove the current 5% restriction on foreign owned parcels of Telstra shares. This would be expected to increase the share value by an additional 10 to 20%, and this expectation should ensure sufficient minority shareholder support. (The USB Warburg submission considered a shareholder premium of c. 30% to be the average accepted in recent non-hostile Australian company take-overs.) Financial institutions would be highly motivated to invest in the new Telstra, knowing the potential of the fully privatised Telstra to boost its multimedia/database advertising revenues through participating full-bloodedly in cross-media ownership. This scenario therefore becomes a win-win for the minority shareholders, the community, the economy (through faster roll-out of advanced infrastructure) and the rest of the telecommunications industry. providing a dividend stream adequate to fund the Federal Government’s bonds sold to buy back the wholesale network carrier, as well as providing an annual surplus (although the Government may need to forgo that surplus in the first two years in order to accelerate national broadband rollout). The timing of the structural separation scenario outlined in the previous section could not realistically be accomplished before 2007 at the earliest, even if it received bipartisan support. The impact of such a split would be to greatly improve access by Telstra’s competitors to the fixed network infrastructure in all regions, at equable wholesale pricing, and would see a faster roll-out of advanced infrastructure across the nation. Thus one would expect a competition-driven improvement not just in the pricing of services in the major business districts, but also in the pricing and availability of advanced services in regional centres and outer metropolitan areas. A future federal government would be tempted to privatise the wholesale carrier, to receive another major short-term cash injection (at the expense of a strong future dividend stream). Such a sale would place NetCo under the same short-term pressures from the financial institutions for maximum profitability that have deterred Telstra from adequately investing in roll-out of network infrastructure since its initial privatisation in 1997. This would be counterproductive to the national interest – until NetCo has achieved a worthy national target, such as providing an affordable broadband access network capability within reach of 99% of Australian residences. At that time NetCo will have served its initial strategic purpose, and its privatisation could be reviewed. It would be prudent to institute a price control regime on NetCo’s wholesale services analogous to the retail pricing regime currently imposed on Telstra. DCITA could be requested to recommend a suitable regulatory regime, after holding an independent public inquiry into the options. The current Telstra has made investment decisions on all the components of its fixed network business, whose longevities can be independently assessed from the depreciation periods allowed by the ATO. The internal transfer pricing set within Telstra for wholesale pricing to its retail product divisions should logically reflect those depreciation periods, which reflect periods of commitment to use of those capital investments – except where new disruptive technologies arise (e.g. VoIP) which might cause a write-off of particular legacy networks or systems (eg the conventional circuit switches within the PSTN). However a fully privatised retail Telstra might be tempted to take a different view of those fixed network assets, post-separation. It might, for example, decide to purchase either SingTel Optus’ or Nextgen Networks’ long haul optical fibre network – which interconnect most of the mainland capital cities – and ‘turbocharge’ it with higher capacity transmission systems, thus freeing itself from the need to lease NetCo’s intercapital city network – and greatly reducing the revenues available to NetCo. There are many such tactics open to a gamekeeper turned poacher. To avoid any such tactical or strategic discontinuities in Telstra’s approach to its current network assets post-separation, it would be essential for the terms of separation to include the setting of firm contracts for the continuing use of that infrastructure. The appropriate periods of these contracts could match the depreciation periods currently used by Telstra for writing off the underlying costs of the relevant major pieces of its network infrastructure – with fair and equitable exit clauses. The co-operation of Telstra’s principal trade union (CEPU) would be advantageous in moving to Step 2 of the structural separation scenario. The Federal Government as owner of NetCo would be wise to negotiate an advance agreement on capping salary and wage demands within reasonable limits, so as to maintain an improved ratio of Capex to Opex within the new wholesale price control regime. If such an agreement cannot be negotiated, the management of significant parts of the wholesale national network should be regularly tendered out, to ensure ongoing benchmarking of labour costs for the desired operational performance targets. The second half of 2004 provides a timely opportunity to revisit the public policy benefits of structural separation of Telstra, returning the national wholesale fixed network business into 100% public ownership, and allowing full privatisation of the rest of Telstra’s business. Why is the timing opportune? Because for once the pendulum of community concerns about inequities in telecommunications services is in alignment with the economic regulator’s (and the rest of the telecommunications industry’s) concern that Telstra is too big to be regulated effectively, and has gained unfair advantages through its integration of monopoly wholesale and dominant retail businesses. This paper spells out the many benefits for the national economy, the community and the rest of the telecommunications industry that can be achieved by a government buy-back of Telstra’s current fixed national network. It suggests a solution to the network buy-back that would avert the two major areas of political risk: an adverse reaction from Telstra’s minority shareholders, and the necessity to push the federal budget into deficit to finance the buy-back. It would be a considerable political challenge for any incoming federal government to ‘put the genie back into the bottle’, without being sure of widespread community support. A safe first step would be to reconvene the aborted 2003 parliamentary inquiry into structural separation, and at least let all the arguments, for and against, have the benefit of a full public policy review.
. ACCC media release, ‘Telco market not truly competitive’, 22 July 2004.
. OECD Communications Outlook 2003. The OECD’s comparative data for June 2004 are due to be published in September 2004.
. In December 2004 Australia’s broadband penetration was 4% compared to over 55% in Sweden.
. Telstra, Submission no. 59 to the Telstra Inquiry, Jan. 2003, p.4.
. Telstra, Submission no. 59, op. cit., p.9.
. Macquarie Research Equities, op. cit.
. The exception is Unwired Australia, which raised an additional $100M in November 2003.
. ‘in the order of …. $259M and $169M respectively’. ibid, p.19.
. ‘Sovereign risk’ is the risk that a government will impose regulations that reduce or negate the value of a commercial agreement, e.g. by changing the foreign exchange rate, or defaulting on a loan.
. Finance/CITA, Submission no. 58, op.cit., p. 21.
. as distinct from separate accounting for Telstra’s self-defined wholesale and retail products, as required at present.
. Telstra’s current market capitalisation, representing 49.9% of its total asset value, is c. $30B.
. This is $25B cheaper than the total takeover option analysed by Finance/CITA in Submission 58.
. There would no longer be a political imperative to avoid foreign control of Telstra, since it is the fixed network – not the Telstra brand name – that is the major national asset requiring protection, and this would stay in Australian ownership via the government buy-back. Peter Gerrand is a company director, academic and independent consultant in ICT strategy and business innovation. He was awarded the Charles Todd Medal by ATUG in 1998 ‘for outstanding contributions to the telecommunications industry’, a Centenary Medal in 2003 ‘for outstanding service to science and technology particularly to public science policy’, and Life Membership by the TSA in 2003. Amongst career highlights he has been a general manager in Telecom/Telstra successively leading network research, product development, planning and network strategy (until 1993); and subsequently a professor of telecommunications at two universities (RMIT and Melbourne) and the founding CEO of a publicly listed company (Melbourne IT: 1996 to 2000). From 1993 to 2003 he was Chairman of the Telecommunication Society of Australia Ltd, and since 1994 has chaired the Telecommunications Journal of Australia (TJA). This entry was posted on Wednesday, October 27th, 2004 at 9:00 am	and is filed under Telecommunications. You can follow any responses to this entry through the RSS 2.0 feed. You can leave a response, or trackback from your own site.